The results can be amazing. People who have undergone a natural detox process literally lose pounds in just days. And the best part of a detox is it uses your body’s own digestive and metabolic systems to do the work. All you have to do is give your body the hydration and micronutrients it needs during your cleanse—the rest is automatic! That’s where The Hollywood 48 Hour Miracle Diet® comes in – the original, natural detox. It provides essential vitamins and minerals as well as a significant portion (roughly 1/5) of the fluids your body needs. Natural detoxes typically use a combination of water, juice, and whole foods (like fiber-rich bran) in moderation because this type of natural cleanse is less stressful for your body, helping you feel better during and after the process. Studies have shown people who use The Hollywood 48 Hour Miracle Diet® detox cleanse can lose as much as 10 pounds in just two days. Results will vary, but that weight loss can give individuals a huge leap forward when beginning a new diet or exercise routine for a healthier lifestyle. Much of the processed food we eat (and the commercial beauty products we use) have harmful chemical additives that actually leach into our body and stay there. A natural detox allows your body’s natural filtering process to purge this “toxic load” and get your body back in balance. Many people who undergo a detox cleanse report improved brain function. Chemically “resetting” your body can increase memory, decrease drowsiness, and improve sleep patterns. 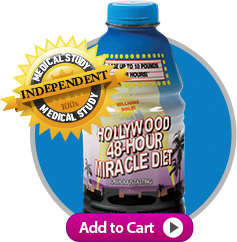 The Hollywood 48 Hour Miracle Diet® is likely the first commercially available natural detox cleanse sold in The United States. It’s been “on the market” and used by thousands of individuals well before detox cleanses became trendy! It’s a tasty blend of pineapple, apple, and orange juice with the power of apricot, peach, and banana purees added in for their natural vitamin and mineral content. It contains Vitamins C, D, B2, B12 in addition to niacin, folic acid, and more—almost everything you need in one bottle. All you have to do is add an equal amount of water and it’s ready to drink! 5) Be amazed at the results! Interested in being a lighter, happier, refreshed you? Get the Hollywood 48 Hour Miracle Diet® and start shaping the new you today!